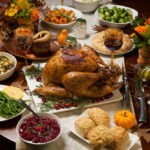 This year, the average cost of a full Thanksgiving dinner for 10 persons is $49.12; 75 cents or 1.5% lower than last year, 3% lower inflation-adjusted, and the lowest inflation-adjusted price since 2010. The priciest inflation-adjusted Thanksgiving repast was $62.40 in 1986; the lowest, $44.73 in 2000. Based on the average hourly wage, this year’s feast “costs” just 2.21 hours, down from a high of 3.21 in 1986. Happy Thanksgiving!